Since time immemorial, Maa Vaishno Devi Yatra has been one of the sacred pilgrimages in India. Millions of pilgrims eagerly await ‘Mata ka bulawa’ to embark on a holy sojourn every year. It is believed that until the Goddess doesn’t invite, you can’t pay homage at the Vaishno Devi Shrine. Nestled beautifully amidst Trikuta Hills, the temple is the holy abode of Mata Rani who resides here in ‘Pindi form’ within a cave. Considered as a manifestation of the Hindu Goddess Mata Adi Shakti, the presiding deity fulfills the wishes of anyone who comes here with a pure heart. So, if you, your parents or family are wishing since long to plan this Yatra, here’s a complete Vaishno Devi travel guide for you. 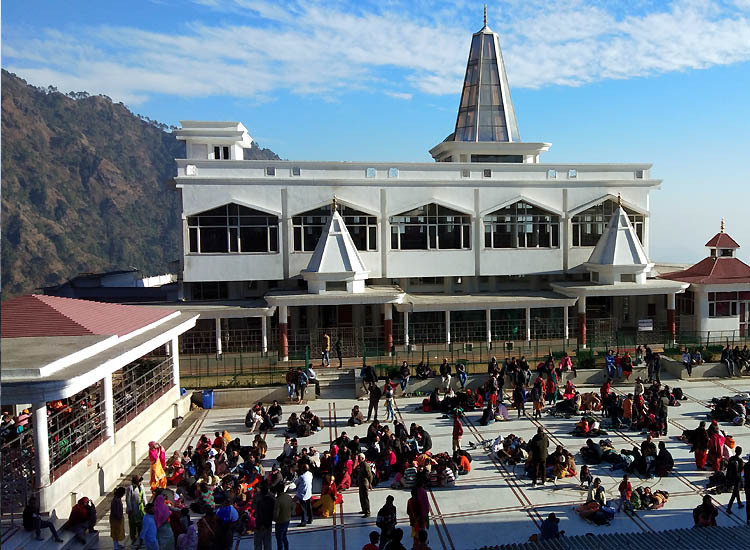 Whether you are a first-timer or have already been to the sacred Bhawan of Maa Vaishno, this blog may help you a lot. From new routes, Yatra registration process to accommodations, you can find detailed Vaishno Devi information here. Plan a trip soon, as only a few lucky ones get a chance to cherish this heavenly experience. How to reach Vaishno Devi in Katra? Regarded as one of the most visited temples in India, the Vaishno Devi Shrine is located in Katra. The beautiful town is a part of an attractive state Jammu and Kashmir which is strongly connected to the rest of India. So, you can easily reach here by various means of transportation mentioned below. Jammu Airport is nearest to Katra and lies at a distance of 49.0 km. From the airport, you can easily get a bus or taxi to the town. One-way flight ticket to Jammu from Delhi costs something around INR 3,000 or more. 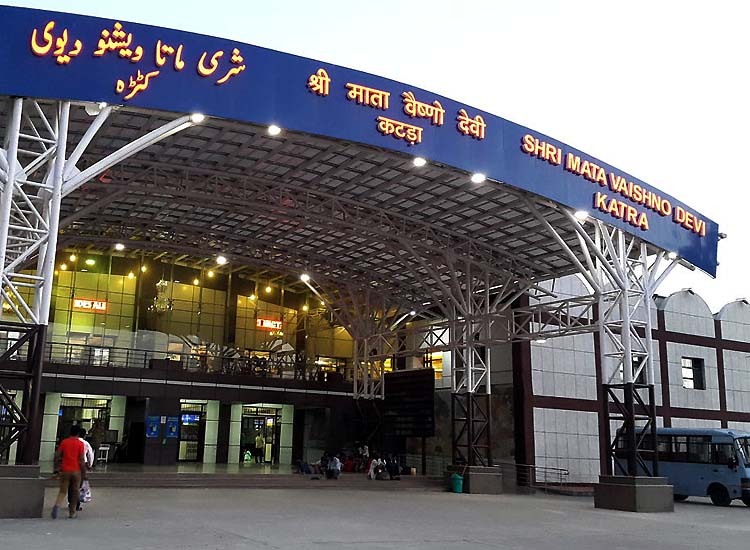 To reach here by train, deboard at Shri Mata Vaishno Devi Katra Station which is just 1.4 km away. In fact, visitors often prefer traveling aboard New Delhi to Vaishno Devi Trains to make their journey comfortable. A Vaishno Devi train passes through several tunnels and helps you delight in awe-inspiring vistas. Fares of a Vaishno Devi train ticket range between INR 385 to INR 2415 depending upon the train and class you choose. Tourists traveling by road, either through private or public transport enjoy a delightful journey from Jammu to Katra. The unwinding roads, panoramic views and many other interesting features take away all the weariness easily. However, the distance between Jammu and Katra is 44.5 km. From Katra station, you can easily get an auto rickshaw to reach Fountain Chowk and further proceed for your Yatra. Once you make your way to Katra, a number of private and budget hotels, dharamshalas and government accommodation are available here. 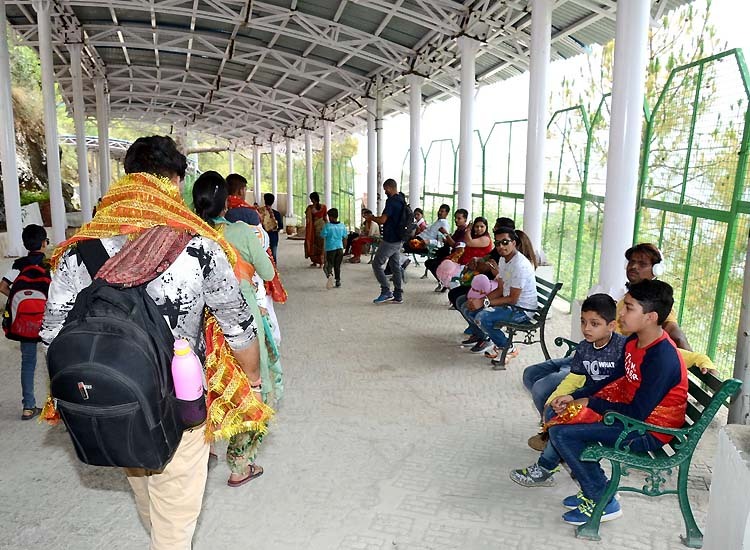 In addition, Shri Mata Vaishno Devi Shrine Board (SMVDSB) also offers three types of accommodations for the ease of the pilgrims. These are free accommodation, rented dormitories and rented rooms. Rented dormitories/rooms are available to the devotees against advance reservation. You can choose any of them to stay and unwind yourself before the Yatra. The reservation of a bed in a dormitory at Katra costs INR 100 and INR 120 at Bhawan and Adhkuwari. The first and most important thing you have to do is to get yourself registered for the Vaishno Devi Yatra. Head to the Yatri Registration counter near bus stand or railway station at Katra. This service is free and easy. You have to stand in a queue and wait for your turn. You may get lucky enough to find no queue at all. Tell your name and hometown. Get yourself photographed. Next, they will give you a printed entry pass also known as ‘parchi’ with your name on it. Keep it with you safely and show it at different checkpoints when asked for the same. Many remarkable efforts have been made to make the process a lot easier. Now, devotees can choose Vaishno Devi online booking for the same process according to their convenience. Do the deed sitting at your home. But, make sure that you carry a printout of the slip along with you. Earlier, there was only one route from Katra to Bhawan which commanded an arduous trek of around 13 km. However, with the passage of time, new routes have been opened up. These routes do not only cut short the distance but also make the sojourn hassle-free. Moreover, the challenging trek becomes easy with people chanting Jai Maa Vaishno Devi Jayakaras from time to time. Choose any, as each of the routes has something special for you. 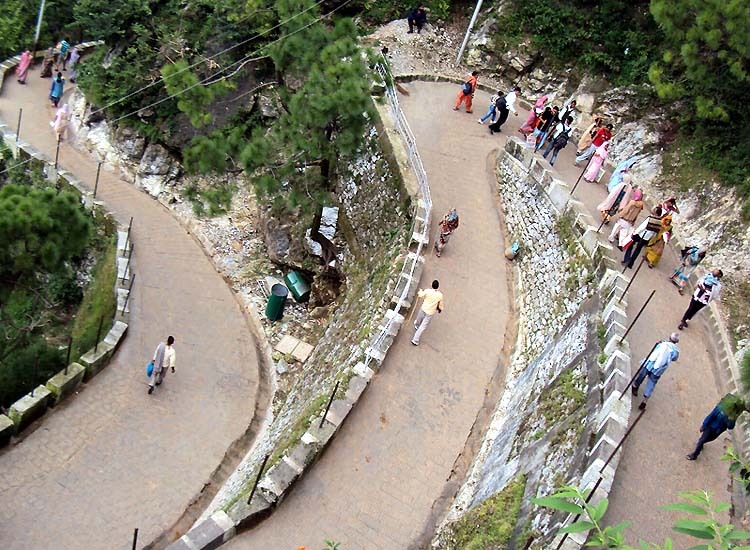 In the olden days, the only route to Maa Vaishno Devi Cave was unpaved and consisted of a few flights of stairs. Hailed as the original route, it was filled with dirt and had sharp turns. But, after some time, it got a makeover and now you get to see paved and wide road covered with tiles. Now, it is covered with shed and has loudspeakers that play hymns of the Goddess at a subtle voice level. As a matter of fact, you get carried away with the positive vibes in the air. Additionally, proper lighting facilities, water coolers, toilets throughout the track make it easy for you to trek. Apart from all these, what makes the original track retain its authenticity are the various points testifying the visit of Maa Vaishno. Comparatively easier than the previous one, the new route from Katra to Bhawan is 500 m shorter. Unlike the original track, no ponies are allowed here. Starting from Indraprastha Point just below Adhkuwari, the route ends just prior to Bhawan. Another key point to note about the alternative track is that electric vehicles run on it. Additionally, there are refreshment point, water coolers, a dosa point at Himkoti, toilets and much more en route. Your detailed Vaishno Devi tour guide makes you aware of a new route as well. Introduced recently, the latest route has cut short the 13 km trek to only 7 km. Passing atop a hillock overlooking Katra, the new route consists of medical units, eateries and no steps at all. Featuring non-skid tiles, the way allows pedestrian pilgrims to marvel at scenic views. Water ATMs across the route make the journey bereft of any hassle. Choose any of the routes and you will get the first glimpse of Bhawan a few kilometers before you actually reach there. The first sight causes a sudden upsurge of energy and all the tiredness of the strenuous climb evaporates immediately. The fact that the last 1.5 km of the Yatra is either level or gently sloping downwards brings a big relief to those tired muscles. There are various attractions en route from Katra to Vaishno Devi Bhawan which present a sight to behold. These points are often briefly introduced to the pilgrims traveling by pony or palkis. However, those who chose to travel by foot out of devotion get a nice reward for this. Darshani Darwaza – This iconic gate marks the starting point of your Yatra. 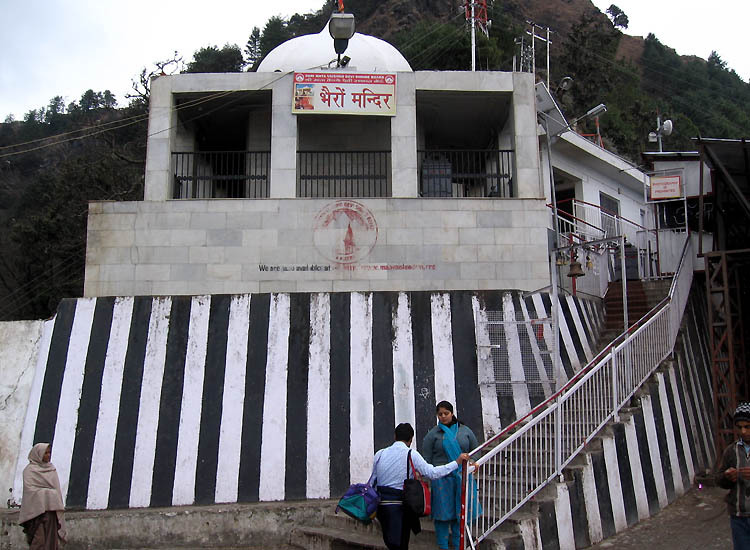 According to folklore, Maa Vaishno in the form of a girl met her ardent devotee Pandit Shridhar here. From this point, pilgrims can savor the panoramic view of the Trikuta Hills. Ban Ganga – A small flowing rivulet reminds you to keep going with high spirits. Another reason for the presence of this small stream here is associated with miracles of the Goddess. At this spot, the divine power quenched the thirst of Lord Hanuman by creating this rivulet with her arrow. She further appointed Veer Bajrangi to stay here and prevent Bhairon Nath from following her. Also, it is said that Maa washed her hair before proceeding to the cave. Since then, followers of Devi, take a dip here before continuing their Yatra. Charan Paduka – Nearly after 1.5 km from Ban Ganga, their stands a beautiful temple with footprints of the Goddess. The ancient temple echoes legends of Mata Rani who stood here for a while to look back. She wanted to ensure whether Bhairon Nath was still chasing her or not. Meanwhile, the imprints of her foot got engraved on a rock. Thus, pilgrims pay obeisance here with full devotion. Adhkuwari – Translating to an eternal virgin, Adhkuwari is the place where Maa meditated and worshiped Lord Shiva for 9 months. She resided in a cave just as a child does in his mother’s womb for 9 months. Thus, the cave got the name as ‘Garbh Joon’. It was after then that Bharion came to know about the Devi who then made an opening in the cave with her trident. She further proceeded towards the Bhawan instantly. Despite that the cave here is very narrow, many followers still pay homage by traversing through it. Moreover, the place also marks the completion of half of the journey. Hathi Matha – The trek after Adhkuwari is very steep upwards to move for about two and a half kilometers. The hill resembles the head of an elephant due to which the point is known as Hathi Matha. You may feel like panting here but instead of counting the hardships, counting the blessings will keep you going. Himkoti – This place lies on the new track. Offering awe-inspiring views of the valley, Himkoti exudes a mysterious and ethereal charm. Sanji Chhat – The highest point of the Vaishno Devi trek, Sanji Chhat is a beautiful small plateau. The holy Bhawan is just 2.5 km away. The walk is really comfortable from here. Passengers undertaking Vaishno Devi Yatra by helicopter have to disembark at the helipad here. Besides, one can find shops, resting place, eatery and a charitable dispensary at this place. 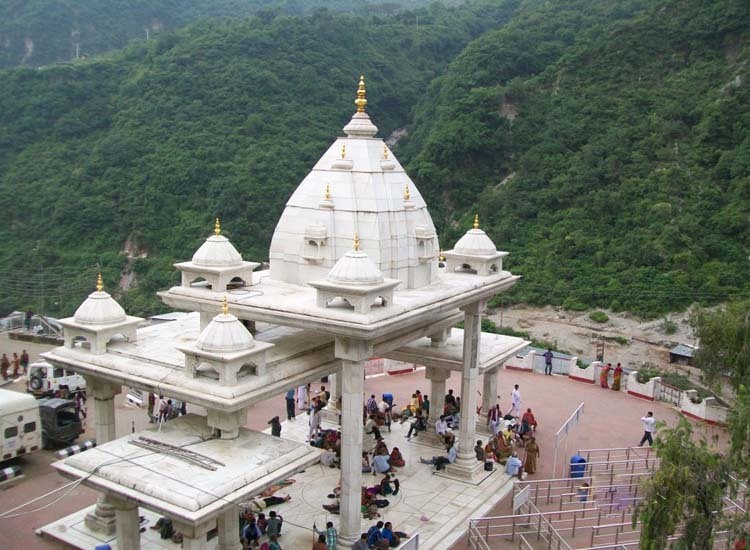 Bhairon Ghati – Usually Vaishno Devi Yatra is considered incomplete without visiting the Bhairav Baba temple. But from the original route, the shrine falls en route to Bhawan. It is the site where the head of Bhairon Nath fell after the Goddess Vaishnavi beheaded him. Legends state it that due to the genuine apologies of the Bhairon Nath, Mata Rani gave him a blessing that he too will be worshipped by her devotees. Otherwise, the Yatra of the devotees will be considered incomplete. Also, Maa not only forgave him but also helped him attain salvation. Thus, visiting Bhairav Baba Mandir after having Darshan of Vaishno Devi is a must. 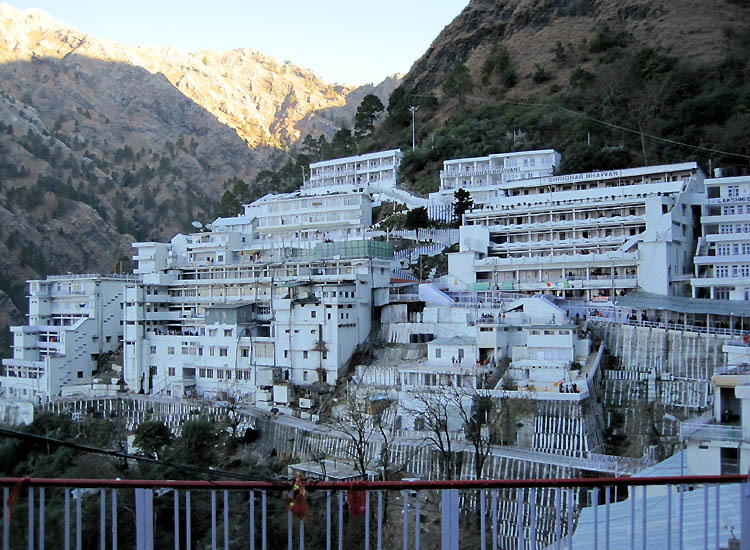 Bhawan – The ultimate destination of the Vaishno Devi Yatra is the holy bhawan or the cave of the Goddess. The sanctum sanctorum welcomes the devotees full of unparalleled zeal and enthusiasm. There dwells the Goddess beautifully adorned waiting for her children to meet them and fulfill their wishes. Not only the introduction of new small routes has made trekking easy but also Vaishno Devi helicopter service has made it a child’s play. A boon for senior citizens, specially-abled people and devotees with time constraints, the service help you fly to the shrine within no time. You can board the helicopter from the helipad at Katra which takes you to Sanji Chhat and vice-versa. A short trek from Sanji Chhat leads you to Bhawan. To get early Darshan, show your return ticket when asked. Pilgrims who wish to choose Vaishno Devi helicopter Yatra can book the ticket online in advance. 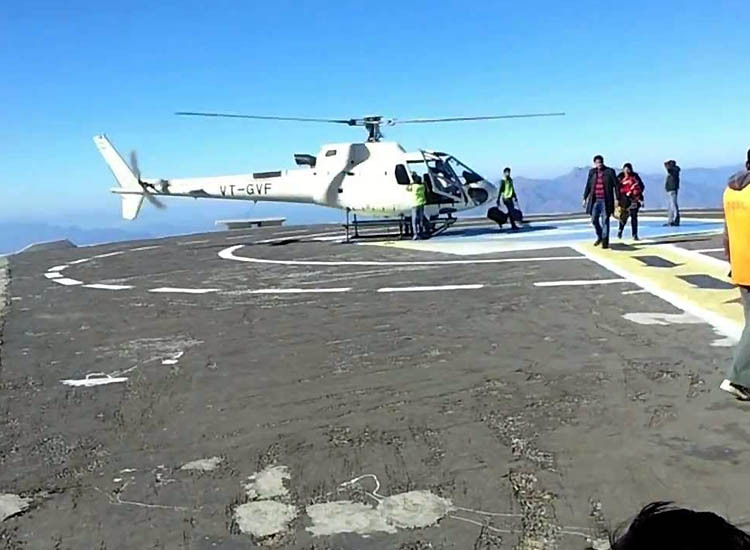 Vaishno Devi helicopter charges are decided by the trust. Booking can be done at the official website of the shrine. Fares for one-way helicopter service from Katra to Sanji Chhat or vice versa is INR 1045. However, if you’re looking for prices for helicopter tickets from Katra – Sanji Chhat – Katra, then you’ve to spare INR 2,090. Also, children below 2 years of age can travel free of cost. However, they shall be carried in the lap of an accompanying adult. Obviously, there are devotees who whole-heartedly yearn to go to Vaishno Devi but are not able to undertake the challenging trek. 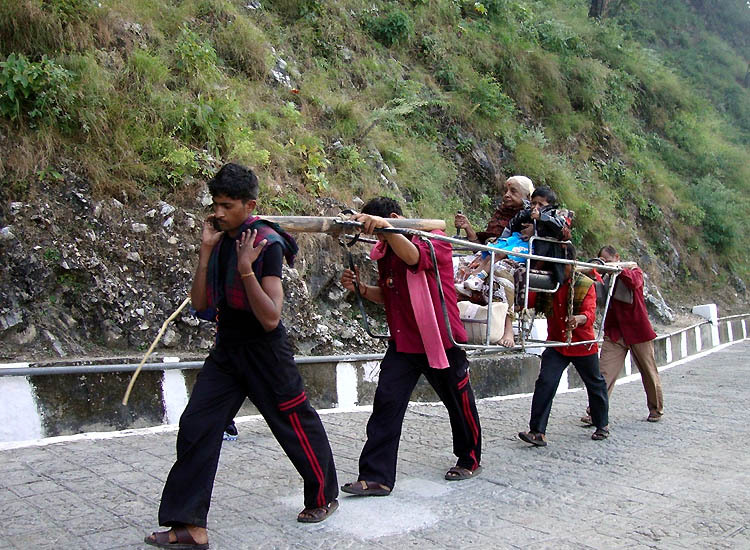 Keeping this mind, palki service was started to enable the pilgrims to reach the holy abode of Mata Rani easily. The charges of palki are fixed and are written on the walls at Ban Ganga. However, you can still bargain with the palanquin bearers. Hitherto, the doli prices for a Yatri up to 100 kg range between INR 1250 and INR 4500. Whereas for a pilgrim above 100 kg, Vaishno Devi palki charges are between INR 1400 and INR 5000 depending upon the distance to be covered. Don’t feel comfortable while walking for long? Or are you carrying a baby or luggage with you? Worry not! Ponies and Pithoos are always at your help. The exhaustion of the trek can be easily overcome by hiring Ponies & Pithoos available from Katra to Bhawan. While Ponies are suitable for people having breathing issues, Pithoos can be sought after to carry luggage or a baby. Again, the rates for the same are fixed. 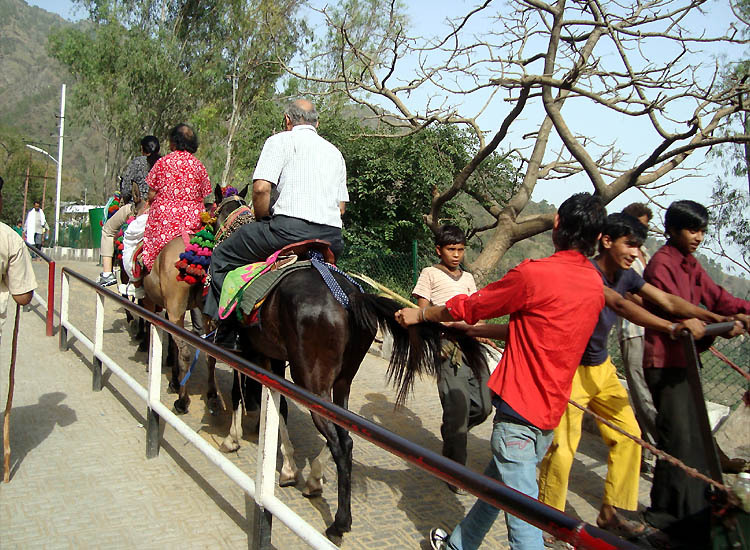 As for now, the cost of pony service from Banganga to Bhawan is Rs. 1250 for adult & Rs. 1450 for an extra child. In general, Pithoo charges from Katra for one way is Rs. 350 and for a round trip is Rs. 700. Apart from this, fares from Bhawan to Katra via Bhairon is INR 400. However, the rates keep on changing. so, you must check them written on the walls at Banganga and follow the further process. Another easiest and safest mode of traveling is via Auto or electric vehicles. 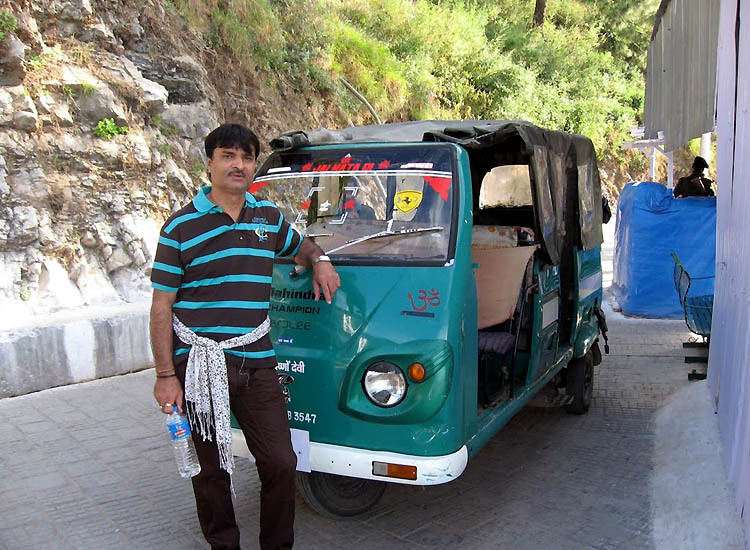 Unlike ponies, pithoos and palkis, auto rickshaws ply from Adhkuwari to Bhawan. Subject to availability, the battery car facility is available for sick, infirm and handicap devotees. Reservation for a maximum of 3 battery car seats can be made by a person online. The devotees have to pay Rs. 300 per person as charges for the car service from Adhkuwari to the Bhawan. While the return fare to Adhkuwari is Rs. 200. There are two checkpoints en route Vaishno Devi trek. Out of the two, the first is at Ban Ganga. Yatris have to show their ‘Parchi’ here. They have to get this slip checked and stamped at this place. After this, they have to undergo a security check. Next, checkpoint is near the Bhawan. Once, you reach, get your luggage checked again. Show the Yatra slip once more at the checking point in close proximity and obtain a group number. This decides your place in the Darshan queue. Although pilgrims can bring the offerings from their home, yet they can buy it from many shops en route. 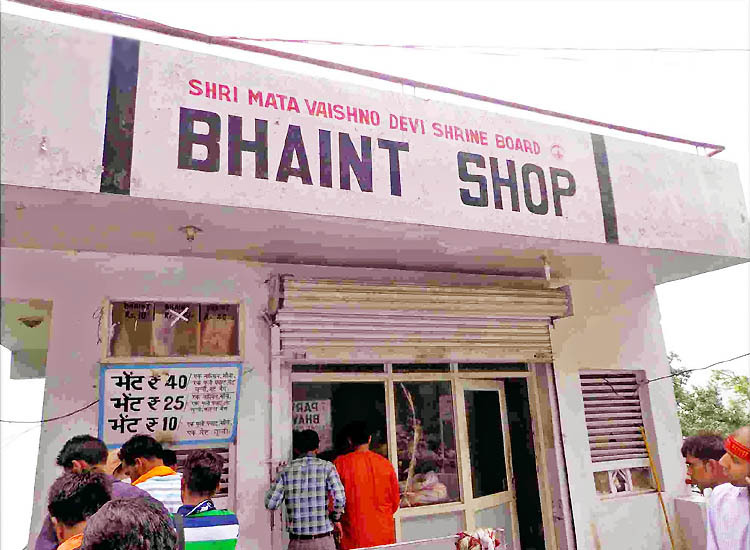 Also, after obtaining the group number, one can reach the Bhaint Shop run by the government and private owners. You can buy Parsad from here which usually consist of coconut, chunni, sacred thread and parsad in a jute bag. Yatris can buy empty bottles from here to carry ‘charnamrit’ to their home. The most important thing for which you have undertaken the enthralling trek and reached here is to have Darshan of the goddess. The Vaishno Devi Darshan timings is not fixed. The temple remains open 24*7. Thus, devotees can get Darshan anytime soon they reach the shrine. But, it is during the Aarti that the pilgrims have to wait for two hours to perform pooja. The Vaishno Devi Attka Aarti is performed twice daily at 6:20 am – 8:00 am and 7:20 pm – 8:30 pm. Read on to know more about the Darshan. Take a bath before proceeding for the Darshan. Separate bathing ghats, toilets and bathrooms are available for men and women nearby Bhawan. Efforts have been made to maneuver the water from the sacred cave to these bathrooms. Thereafter, avail a locker facility and deposit all your belongings including your mobile phones, cameras and shoes there. Subsequently, reach gate number 1. Wait for the announcement of your group number. Once it is called, proceed for the much awaited moment. Meanwhile, you can enjoy Vaishno Devi live Darshan at many of the televisions installed on the way. Usually, it takes no time to have Darshan. But, during peak season or Navratri, pilgrims have to wait for at least 8-9 hours in the queue to get the Darshan. But, the wait during that time is surely worth it. Once you reach in the waiting hall, you will find a designated area where you have to give your coconut. In return, you will get a token. Keep it safe with you. Next, you proceed towards the entry point to the shrine. You will see two caves here. Out of the two, one is ancient and original. In the bygone era, yatris used to travel through this only. Even today, this cave is open for the public for a few days. Obtaining darshan through this gave is a matchless experience. Since the old cave remains closed majority of the year, two new tunnels are created for the convenience. One is used to take the pilgrims to the holy pindies while the other is designated for the exit purpose. Also, at the opening of the original cave, the torso of the Bhairon Baba is located in the form of rock. 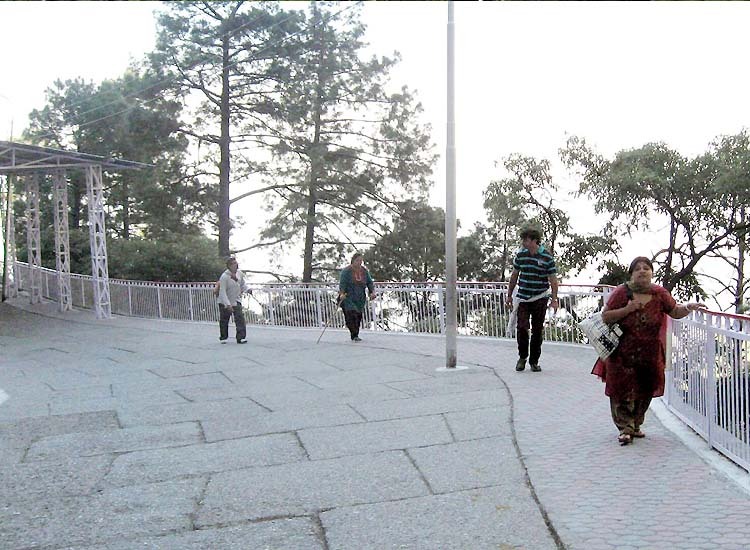 Pilgrims have to step on it before entering the Purani Gufa at Vaishno Devi. At the end of the tunnel, Mother Goddess keeps on waiting for her followers. There are no statues, idols or images. Rather, three pindies representing Maa Lakshmi, Maa Saraswati and Maa Kali collectively represent Maa Vaishno, an incarnation of the three Supreme Energies. Once you reach there, concentrate only on the pindies and the description given by the priests. Bow down, make a wish and move further quickly in order to let other pilgrims have the darshan. What to do after having Darshan of Maa Vaishno Devi? After cherishing the Darshan of Maa Vaishno Devi till your heart’s content, move out of the tunnel. Adjacent to the gate, you will find Amrit Kund and Charan Ganga. Fill the water flowing from the tap in a bottle or just drink it as Parsad. This water comes from the holy cave and is said to have healing and purifying properties. As you move a little further from the Amrit Kund, you will see Parsad counter. Devotees get a parshad in the form of a small pouch containing Mishri and a coin, also known as Khazaana (treasure). You can keep this coin in your wallet or locker where you keep your cash. It is supposed to bring good luck and prosperity. Remember the token you received in the waiting hall upon giving your coconut? It’s the time to use it now! Show the token and get your coconut back as parshad. Later on, devotees have to do ‘Kanya Pujan’. They can either do it at the shrine itself or after coming back to their home. To cater to the needs of the pilgrims, various facilities are available during the course of the trek. Here’s a list of services one can benefit from. There are five Bhojanalayas en route to satiate the hunger of the travelers. These eateries are run at the no-profit basis. For this reason, you can savor hygienic food here at cheap and affordable prices. Apart from these, there are many privately owned food joints all along the way. Braving the step climb is indeed difficult. So, taking rest for a while is quite obvious. Furthermore, the weather also sometimes become unpredictable during the trek. Under those circumstances, yatris can halt at the shelter shed covering much of the trekking trail. Vaishno Devi Yatra involves strenuous trekking and the shrine is nestled at a high altitude. For this reason, a medical checkup and consulting your doctor before proceeding is always advisable. Patients prone to asthma, cardiac and orthopedic problems are prevented from using stairs. Having said that, emergencies can occur anytime. So, a block hospital is available Katra. In addition, one can find charitable dispensary which works round the clock at Banganga, Adkuwari, Sanjichhat and Bhawan. At a few handpicked locations, visitors can easily find refreshment points. Besides offering light snacks and drinks, these units provide mind-blowing views of the nearby surroundings. Sip on freshly brewed coffee or tea. Or else, you can buy milk or cold drinks. Biscuits, popcorns, mineral water along with other refreshments are also available here. Usually, yatris feel the need of blankets at night. Provision of the same is accessible at the blanket stores at various locations. Although the service is free of cost, yet a nominal and refundable security deposit fee has to be paid. Visitors get entire amount refunded once they return the blankets. Cloakroom facility is at one’s disposal any time of the day or night. Tourists can now leave behind all their excess of luggage in the cloakroom available at the hotel, lodges, guest houses, etc. As a matter of fact, video cameras, mobile phones and other electronic equipment are not allowed. So, yatris can either make appropriate arrangements for the safekeeping of such items or keep them in the cloakrooms. If you want to carry a memento of the sacred pilgrimage, you can head to any souvenir shop at Jammu, Katra bus stand, Adhkuwari, Sanjichat and Bhawan. Gold coins, silver coins, chunri, chura, cholas, CDs, etc. are available here at less prices. 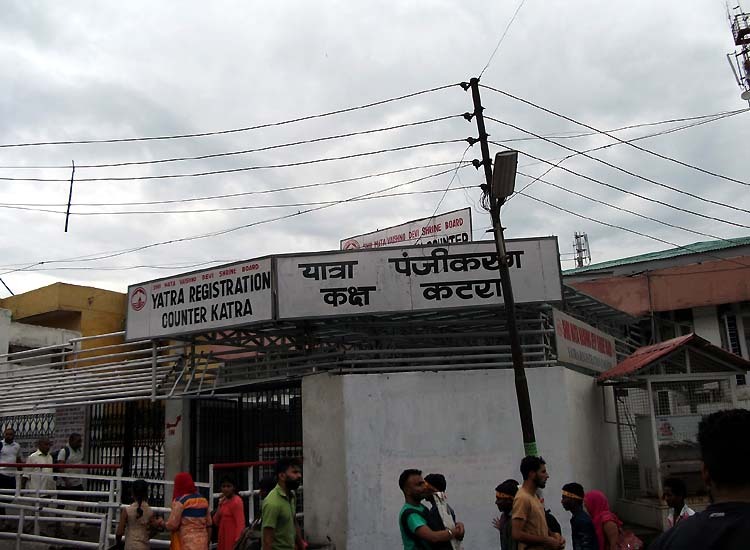 Branches of many private and nationalized banks are at Katra. Additionally, ATM facilities in the town also enable tourists to avail benefits anytime. Bank branches are also available at Adhkuwari and Bhawan complex. Private hotels near Vaishno Devi Bhawan are available to provide neat, adequate and clean resting places to the pilgrims. Also, there are many other resting spots like Manokamana Bhawan, Saraswati Bhawan where tourists can spend a night. Waiting Halls are constructed for the comforts of the devotees. One can make an online booking or reserve the space on the first-come-first-serve basis. One of the latest advancements made is the introduction of the Vaishno Devi Ropeway. The cable cars in the ropeway take devotees from Bhairon Ghati to Vaishno Devi Bhawan in just 5 minutes. So, now there is one more option available making the holy pilgrimage easier than ever before. Ropeway ticket to Vaishno Devi temple costs only 100 Rs. Furthermore, tickets are available on the spot at Bhawan. The ropeway can carry 800 people every hour and is operational now. Because of the extreme ascent from Bhawan to Bhairav Baba Mandir, the hike turns to be a tiring one. 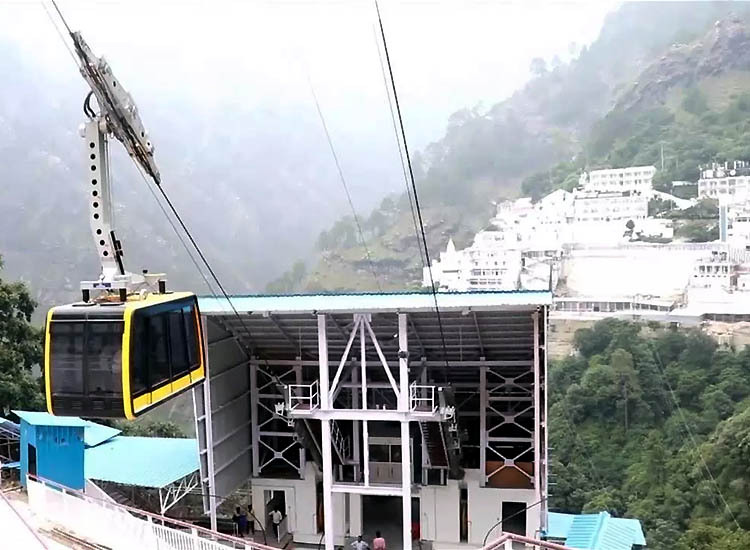 But, as now Vaishno Devi gets the ropeway service, reaching the shrine will be a fun full of unparalleled adventure. Maa Vaishno Devi Shrine remains open for the pilgrims throughout the year. But, the best time to plan Vaishno Devi Yatra is between the months of March and October. One of the reason is that the climate is cool and pleasant during these months. Also, the shrine receives a huge footfall during the Navratras, May-July and New Year vacations. So until and unless you’re an ardent devotee or are ready to face a huge crowd, you can avoid your visit during this time. There is another reason for planning your Vaishno Devi trip during off-peak season. You may become lucky to have Darshan through the original cave. Planning a trip during winter months is also considered as the best option to witness snowfall. Besides the holy cave, there are other places to visit in and around Vaishno Devi Shrine. Read on to know more. Temple of Lord Shiva: Just after coming out from the coconut reclaiming counter, you will find a few steps descending downwards. These steps take you to the temple of Lord Shiva where a Jyotirlingam of the Lord is nestled in a cave. Other temples: A few other temples of Mata Durga, Shri Ram with Sita and Lakshman, Lord Hanuman, etc. are situated at the different points of the Bhawan complex. Signboards have been put up at Bhawan to guide the yatries as to the location of these temples. Dera Baba Banda – The 300 years old Gurudwara which is dedicated to Baba Banda Bahadur lies in close proximity to Katra. Nau Devi Temple – A cave temple which houses 9 deities believed to be incarnations of Goddess Durga. The shrine is also located near Katra. 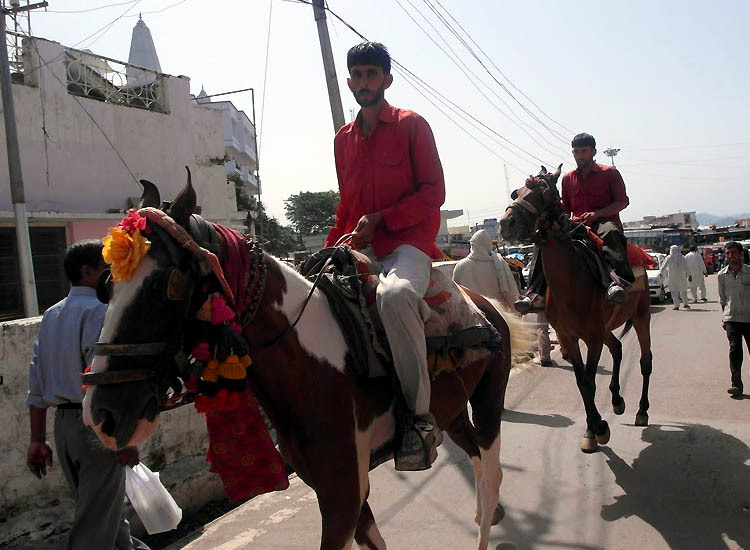 Kol Kandoli – Situated in Jammu, Kol Kandoli is said to be the first milestone of the Vaishno Devi Yatra. Maa Vaishno spent her childhood here. She appeared here as a girl of age 5 and did penance for 12 years. 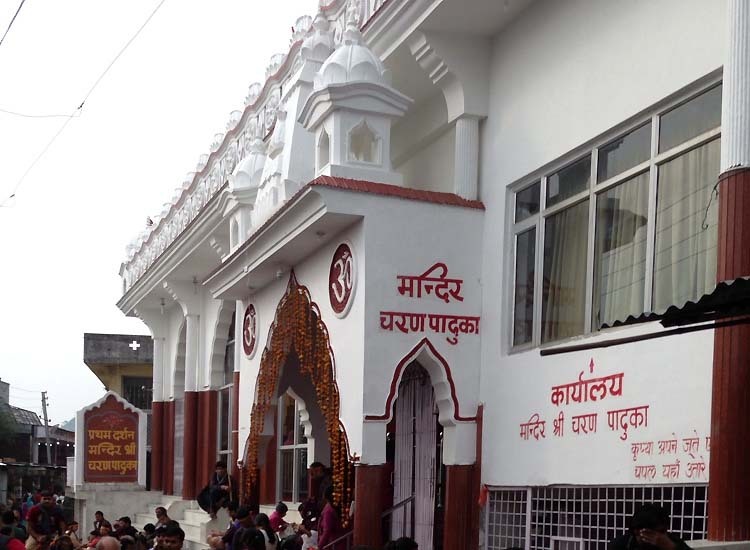 Raghunath Temple – Another one of the top tourist attractions in Jammu is Raghunath Temple, dedicated to Lord Rama. 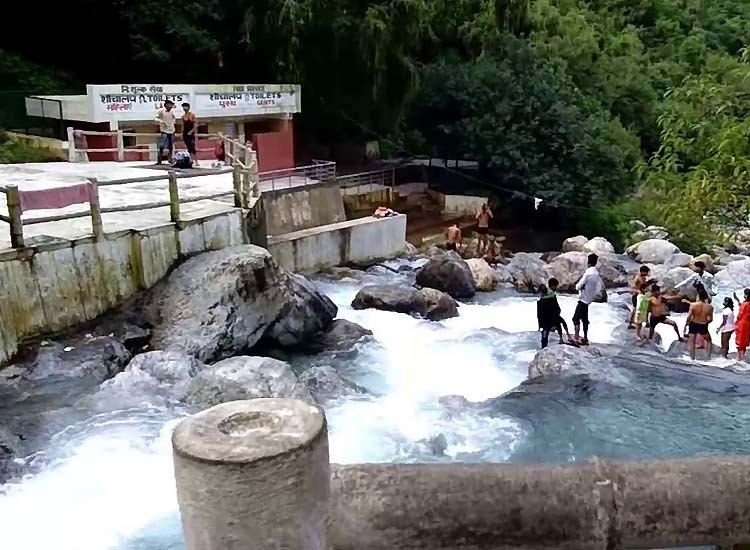 Shiv Khori – Most of the people visiting Vaishno Devi also extended their pilgrimage to Shiv Khori. The holy cave enshrines the sacred lingam of Lord Shiva. Also, folklores connect the holy site to Amarnath Cave which is another highly revered shrine for Hindus. The holy abode of supreme almighty is located 70 km away from Katra. Patni Top – Treat yourself to the astounding views at Patni Top. A famous picnic spot is thronged by visitors who love to play with the snow and enjoy fun-filled moments. Mansar Lake – A scenic lake surrounded by forest-covered hills. Bahu Fort – Perhaps the oldest edifice and fort in the city. Embarking on a pilgrimage requires some instructions to be followed. Vaishno Devi trip planning is no exception. Pilgrims should adhere to some rules and follow the instructions provided. Be a responsible pilgrim and try to help the fellow yatris. Use dustbins to throw your garbage. Motivate other pilgrims en route. Prepaid SIM cards do not work in Jammu and Kashmir. But you can always use postpaid or local SIM Cards. In case anyone gets lost, simply inform at the shrine offices or security guards. Maintain the sanctity of the place. Be aware of the monkeys. They instantly jump out of nowhere and usually attack on your mobile phones, parsad and other eatables. Keep them at bay but don’t throw stones on them. If travelling in monsoon season, pack a raincoat and in case of winter months, keep woolens with you. Deposit your offerings only in the donation boxes. Except for cash and selected offerings, nothing is allowed inside the Holy Cave. So, don’t carry any extra items with you. Don’t carry articles of general use like belts, wrist watches with leather belts, combs, pen, pencil, purses, handbags, etc. Don’t shout slogans of praises around the sanctum sanctorum and inside the tunnel. Don’t litter here and there. Don’t stand for too long near the landslide-prone areas. Don’t harm the ponies, porters, pithoos or palki owners. Don’t use the stairs if you are a heart patient or are prone to blood pressure issues. Using shampoo, soap, oil, etc. at the Bathing Ghats is strictly prohibited. Avoid offensive language or vulgar gestures en route. Smoking, drinking liquor, eating non-vegetarian food or betel leaves and chewing tobacco is strictly prohibited. The Yatra to Vaishno Devi spiritually awakens you from within. If still in doubt, do book any of the Vaishno Devi Yatra packages and travel with ease. Hope you discover a divine within you. Jai Mata Di! 2 comments on "An Ultimate Guide to Vaishno Devi Tour"
I am glad that you found the article informative and are planning to visit Vaishno Devi soon. Do share your experience with us. Also, don’t forget to follow our blogs in the future.